This article provides an overview of how to size paddocks and estimate the number of acres of pasture needed for a dairy herd. It is also helpful to attend a grazing workshop or school to learn how to set up a pasture system, estimate dry matter, and gain other important grazing skills that this series does not address in detail. In a management intensive grazing (MIG) system, cows graze pasture rapidly down as short as two inches, then plants are permitted to grow back up to at least eight inches. The density of plants in the pasture will have a large influence on how much available dry matter is in the pastures. If the plants are far apart (low density) and soil can easily be seen between the plants, there will be far less dry matter per acre in the pasture. The best way to learn how to estimate dry matter is to attend pasture walks or workshops. The density and quality of pastures will increase with good grazing management. The amount of pasture dry matter an animal will eat depends on many factors, including lactation, growth, animal size, supplemental feed, and pasture height and density. A reasonable estimation of the amount of dry matter intake (DMI) that a lactating cow can harvest by grazing well-managed pasture is at least 3% of her body weight. This means, for example, a 1,000 pound cow will eat 30 pounds of pasture dry matter per day. Note that this is just an estimate of pasture DMI and assumes some additional feeding in the barn. It is always best to use real numbers from the farm. Figure 1. Example of a correctly sized paddock with a high stocking density on Massachusetts farm. Photo credit: Sarah Flack, Sarah Flack Consulting. The paddock sizes will depend on how many animals are in the group, how long they will be in the paddock, and how much feed is in the pasture (see Figure 1). The following example calculates the paddock size needed for a herd of 50 Jerseys on a farm where they receive a fresh paddock after each milking. Refer to the pasture Worksheet 1 at the end of this article to plug in the example data. After following along with the example, try calculating the required paddock size for your milking herd. Line 1: Enter the estimated weight per cow of 1,000 lbs. Line 2: Enter 3%. Note that on this example farm they plan to supplement with some dry hay and grain in the barn. Line 3: Multiply 1,000 lbs. x 0.03 to get 30 lbs. of DMI from pasture per cow. Line 4: Multiply 50 cows x 30 lbs. DMI to get 1,500 lbs of DM needed for the herd per day. Line 5: This example farm has decided to use a pregrazing height of 8 inches and has estimated their pasture plant density to be “average.” Use the chart in the worksheet to get an average pasture mass or dry matter per acre. According to the chart, the pasture mass is 2,600 lbs. Enter 2,600 lbs. on line 5. 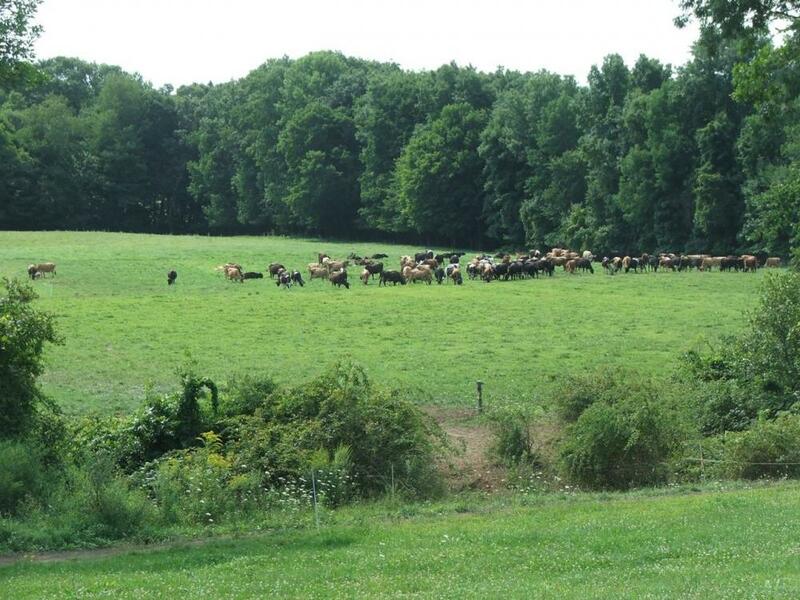 Line 6: This example farm has decided to have the herd graze the pastures to approximately 2 inches. Using this information in the same chart you used above, enter 1,200 lbs. on line 6. Line 7: Calculate 2,600 lbs. – 1,200 lbs. = 1,400 lbs. This is the estimated amount of DM available for the herd to eat per acre. Line 8: Divide the amount of DM required (line 4) by the amount available (line 7) to calculate the number of acres needed: 1,500 lbs. ÷ 1,400 lbs. = 1.07 acres. Note that this is the number of acres needed per day (24 hours) to feed the herd. Since this example farm decided to give them a new paddock after each milking, or two paddocks a day, the half-day paddocks will be 0.54 acres each (1.07 acres ÷ 2 = 0.54 acres after each milking). This method of paddock size calculation is a good place to start. It will be necessary to adjust the actual paddock size based on several factors including:. Plant density may be lower or higher than estimated. The number of paddocks or total number of acres of pasture needed, can be calculated if it is known how long the pastures will need to regrow after each grazing. Research done by Dr. Bill Murphy in Vermont produced the following average regrowth periods. The regrowth periods on different farms and different parts of the country will likely be shorter or longer. Information on the actual amount of time needed for complete regrowth in different parts of the country can be found at the local USDA Natural Resources Conservation Service (NRCS) office, county extension office, or from a grazing consultant. Example 2 calculates the total number of pasture acres needed for the example farm discussed earlier in this section, and uses the average Vermont regrowth numbers listed above. For grazing planning, it is helpful to keep records of how often and for how long each paddock is grazed each year. Records can be kept on a copy of the farm map, in a notebook or worksheet which includes the date, where the animals grazed, and for how long. These records will provide information on the actual rest periods throughout the growing season. Walking regularly through all the pastures at least once each week and recording how many inches each paddock has grown back is another way to collect information on regrowth periods and can also provide information on which order to graze the paddocks. For the 50-cow farm that needs 1.07 acres per day, total acreage needed to graze in the spring will be 16 acres (1.07 x 15 days = 16 acres). When pasture growth slows down to 35 to 40 days, the total needed acreage increases to 38 to 43 acres. If the total pasture acreage is not increased as regrowth periods increase, plants will not get enough rest and dry matter intake by animals will drop, resulting in poor animal and pasture performance. What if There is Not Enough Land? Once the number of acres needed to set up the grazing system has been calculated, it may become clear that the farm does not have enough land suitable for grazing within cow-walking distance of the milking facility. In some cases, unless additional land can be obtained, the farm may not be a good candidate for organic certification. Plan ahead to make sure the amount pasture acreage meets the needs of each group of livestock throughout the entire grazing season. If there is enough land, it may be possible to plan grazing so that pasture can be available into the fall and even winter in some climates. This requires careful planning so that plants are tall enough when growth stops. Some conditions such as excessive soil moisture or too much snow can make fall stockpiled grazing difficult. For some farms, however, this is a successful way to feed forages. Refer to "Managing Dairy Nutrition for the Organic Herd: Managing Seasonal Diet Shifts" for more information on stockpiling and nutrition. During some weather conditions, grazing some or all of the pastures may not be possible. Flooding makes it necessary to either move livestock to high dry land or keep them in the barn. Anytime grazing is not possible due to an emergency like this it is important to make sure the organic standards are being followed. § 205.239 lists the detail on exemptions to the grazing requirements of the organic standards. High rainfall periods may result in muddy pastures or lanes that make grazing difficult and may even cause hoof or other health problems. Building well-surfaced lanes, using culverts, filter fabric under surface material, and other techniques will make the grazing system much easier to manage in these weather conditions. As global climate change causes more extreme weather conditions, all farms will need to prepare for extended dry periods. Planning for possible drought may mean saving extra stored forages that can be fed during a drought. Other techniques being used successfully by farmers who regularly experience summer droughts include grazing annual crops such as millet or sorghum-sudangrass as well as adding significant acres of hay land which is mechanically harvested early in the growing season. Worksheet 1. Calculating Paddock Sizes and Number of Acres Needed. Attending pasture workshops is a great way to learn how to make these estimates more accurate. *Pounds of dry matter per acre at each height varies widely with plant density and species.